Shillong, Oct 19 : The Meghalaya government Thursday said it had done away with foreign direct investment (FDI) in the mining sector after several organisations protested the controversial Meghalaya Mines and Minerals Policy, 2012 that was approved by the state cabinet Oct 5. "The government has done away with that clause in the Mines and Mineral Policy that encourages foreign direct investment in the mining sector," Deputy Chief Minister in-charge of mining and geology Bindo Lanong told IANS. The state cabinet has however approved rat-hole coal mining in the state. Rat-hole mining is a primitive method that entails clearing ground vegetation and digging pits ranging from five to 100 square metres to reach the coal seams. 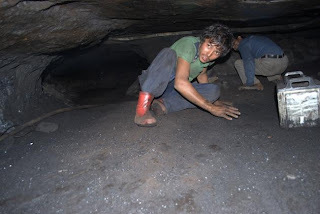 Several organisations under the banner of Social Organisations of Meghalaya against Land Alienation (SOMALA) had earlier demanded that the FDI clause be repealed from the Meghalaya Mines and Minerals Policy 2012. The opposition National People's Party and Meghalaya state unit of Bharatiya Janata Party had criticised the earlier decision of the state cabinet to allow FDI in mining, saying that it would have a negative impact on small-time miners and lead to the total sellout of the state's natural resources. Meghalaya has a total coal reserve of 640 million tonnes, besides 5,000 million tonnes of limestone reserve and other minerals like Uranium. "FDI is a central subject and the state government cannot decide alone on this issue and if the government felt it necessary to go for FDI in the mining sector with an intention to ensure job opportunities to the tribesmen of the state, we would then seek the central government's consent on the matter," Lanong said. "It is their (SOMALA's) misconception on the policy, but the fact of the matter is that the government had decided to do away with the clause that sought to encourage FDI in the mining sector," the deputy chief minister clarified.